Being overweight is not just a problem in human health; a new study suggests that fat horses and ponies are more likely to misbehave than their more svelte counterparts. The research has raised particular interest as it draws parallels with the obesity crisis in humans. Studies in the US have suggested links between being overweight with behaviour problems and lower academic performance in young children. The equine study, Misbehaviour in Pony Club Horses: Incidence and risk factors1, was published last month by The Equine Veterinary Journal (EVJ) and is the first of its kind to quantify the incidence of misbehaviour in a population of horses. The research, conducted by Petra Buckley, Senior Lecturer in Equine Science at Charles Sturt University, New South Wales, involved 84 Pony Club horses from seven different Clubs in rural Australia. Over the period of a year owners kept daily records of horse management including nutrition, healthcare and exercise and recorded any misbehaviour. The horses were checked by a vet every month to investigate any relationship between pain, such as lameness and back pain and misbehaviour. 59% of the horses studied misbehaved at least once during the study year, either during handling or when ridden. Whilst the occurrence of misbehaviour during riding was low, at 3% of horses in each month, in more than half of these cases the misbehaviour was dangerous, and posed a serious injury risk to horse and rider. 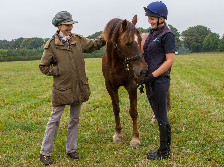 It is possible that the low occurrence reflects selection of misbehaving horses out of Pony Club by concerned families. Risk of misbehaviour was higher in horses that were fat or obese and in those that were ridden infrequently. Horses exercised more than three times each week had lower odds of misbehaviour. The odds of misbehaviour during riding were more than twice as high when horses were fed daily supplements, such as roughage, concentrates and/or grain. Access to “good grass” was also associated with increased risk of misbehaviour, independent of any supplementary feed provided and horses and ponies that were excessively fat were roughly three times more likely to misbehave. This all suggests a link between nutrition, exercise, body condition scores and misbehaviour, where higher body condition scores reflect dietary intake exceeding requirements, a problem that can be exacerbated by infrequent exercise. It was also interesting to note that misbehaviour was more likely when horses were competing – a time when riders may have higher expectations of their horses and subject them to greater physical and mental challenges than during leisure riding. This may result in horse-rider conflict and subsequent misbehaviour. The study includes recommendations to help prevent misbehaviour such as exercising at least three times a week and maintaining an optimal physique by more closely matching pasture and supplementary feeding to horses’ exercise levels and resulting energy requirements. ”Our day-to-day management lays the foundations for healthy horses and highlights the important role and responsibility of every horse owner,” concludes Petra Buckley. The US studies, conducted for the National Institute for Healthcare Management Foundation (NIHCM), were based on data from an educational study of children as they enter school. The study shows that obese girls are significantly more likely to exhibit behaviour problems and that overweight children have significantly lower math and reading test scores compared to non-overweight children. In line with the equine research, the studies also suggest that an increase in exercise could reduce the numbers of overweight girls and thus the related behaviour problems. Professor Celia Marr, equine clinician, RCVS and European Specialist in Equine Medicine and editor of the EVJ said: “It seems that the behaviour of Thelwell’s iconic fat pony, and even Greyfriars’ Billy Bunter, may have some scientific basis! There are numerous studies demonstrating the damage that excess weight can have on equine health and thanks to this research we can now highlight the importance of considering body condition, nutrition and exercise in misbehaving horses.